Right now as I type this essay, I wonder if God is up there smiling or not? What is the emotional disposition of the creator— Gods eye? Does he stand over his domain with pride — was all this his plan? The go-to theistic response to tragic events, like the holocaust, is usually something like: God has a plan. And, apparently, even though he is some how able to grant us objective morality, he is unable to grant us solace in our dark hours. Moreover, what is the excuse, or more so, the reasoning for violence— does God stand over us playing some mythical board game that distributes justice at random whims. Some theists protest that their religion and their Divine drive is founded in Love, and there seems to be some secret long-standing idea that something motivated in Love is categorically righteous. Is this so? 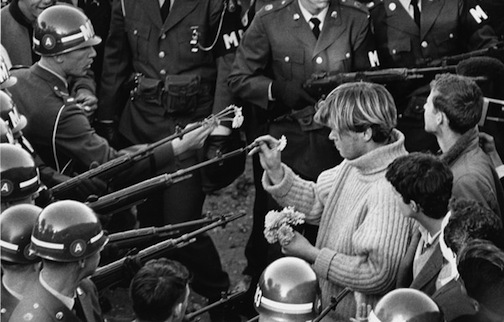 We could perhaps try to minimize the damage of war, or even negate war altogether, by literally and metaphorically putting flowers in guns— fight with Flower Power[i]. But, if the hippies are combatting the violence with Love, does that imply that the opposing disposition is Hate? What if the police, or military, or the entire military-industrial-complex was comprised of members, who in their hearts of hearts, were also compelled by the motivator: Love. If this was true, then how does one respond to a conflict were both parties are equally compelled by Love, and are in their hearts— righteous. We do not need to travel back to the Summer of Love to see exhibitions of conflicts that poignantly reflect battles of Love versus other Love. Albeit, Love for Islam versus Love for Israel or Love for thy Church versus Love for gay equality. How can acts driven in Love, end so badly? Maybe it is reasonable to assert that, maybe: God does not love us. In the Christian doctrine is the idea that God showers us in Love in the form of forgiveness or mercy. He gave us free agency, which allowed Adam to make the free choice to eat the forbidden apple, and from that point forward, we have been burden with our own freedom, as this freedom can lead to our decision to sin. But, for this, he forgives. Even though he mercilessly forgives us for our transgressions, he does not forget— nor should we. Is this an act of Love? If I went to dinner with some friends and foolishly forgot my wallet and they graciously covered my bill— would it be better if they forgave me for not paying my share and expected nothing in return, or shall I pay them back in full. The Loving and Christian mantra would suggest that we should forgive and love— and not ask for the money in return. If this was true, if this was motivated by Love and that was an act of purity, then it would stand to reason that I could forget my wallet many times, if I was so inclined, or so forgetful. But, anybody who has been in the predicament of owing money to a friend would know that even if the friend does not expect anything in return, the debt becomes a burden— the burden of being in debt, but also the desire to balance the scales. Or in other words: an eye for an eye, or in this example: a dinner for a dinner. This notion of forgiveness and mercy, is what Hegel refers to as the meaning of punishment[ii], because the crime is not undone, but rather it remains and “haunts”[iii] and this turns forgiveness and the logic (and idea) of mercy into oppression[iv]. Like poor Adam we are forever burden with this ultimate debt to our maker— and for this, we shall be oppressed. This Divine Love, or excessive and unremunerated Divine debt that can never be repaid— or what Freud referred to as the superego—[v] is the act of Love that humans understand. This is our point of reference for the love continuum we create to understand/reason our own life and love. If the idea of love that we understand and promote is conditional and even paradoxical, then it seems to reason that the act of love we reflect back will reflect back the same qualities. Like a marriage counselor helping a married couple that has lost their way: you need to learn your partners ‘love language’. The love language of our maker, or The Big Other, is conditional, oppressive and is forever our punishment. In 1937 Pablo Picasso painted Guernica[vi] , which depicts a scene of Spaniards being mutilated by the shrapnel of bombs being dropped— while the bull, the symbol of Spain, poses with a look of utter dread and disdain. The historical significance of this piece is that it depicts the first time in world history that airplanes were used in war as a means of dropping bombs on people. This profound and tragic social commentary of Picasso is suggesting that using airplanes in war removes the humanity from war, as a solider is now denied the right of starring their victim in the eye before they take their life. This act of violence, in its unattached and indiscriminate nature, is man mimicking his maker. The Spanish Revolution was a historical action of positivity, as the Spanish proletariats rose up to fight oppression from the ruling and governing class. But, like the perverse Love of our maker, our father, this loving desire to rid Spain of the oppressed, became death and despair. Inclusive of a fantastically metaphorical Divine Thunderbolt; realized in the bombing raids that crippled and destroyed Spain. We cannot truly answer the subjective question of Does God Love Us— it is presumptuous for me to assert Gods Will. However, if his loving act is an act of oppression and if this idea of love becomes our idea of love and we act this out. But only in the case when the father figure, or Big Other, is not existent. [vii] Meaning, if a revolutionary is fighting a battle against their own state, then, in that instance, they are not represented by the state, in other words: there is no political Big Other, hence the revolutionary agents act as a metaphorical Big Other. Mirroring God and becoming God, by reflecting his omnipotent mercy and eternal Love to other humans. If this is how God Loves, it is reasonable to assert: God does not love us. Or at least not in the gooey, unconditional, hallmark way we normally associate love with. In the moments of pure human desperation, when we have lost our metaphorical bond to our Big Other and, perhaps, also feel a detachment from the Real, we become God, and act out in horrifying violence qua violence of Biblical proportions. If this is something that happens its possible to argue that our love is not a reflection of our Father, but more that our Father is a reflection of us. In other words, we act out Divine Violence, because we are God. God is burdened with our sins, so we don’t have to be. But, if there is no God, we instantaneously become guilty and burdened with sin— the freedom and dread of existence, plus the burden of our transgressions becomes overbearing and drags us down into a spiral of infinitely compiling despair. The only way to free ourselves from this is to outwardly project all of this on to something with infinite capacity to hold our sins— and this act is, to us, Love. In the perverse love story of humanity, we are, for better and worse, simultaneously, eternally and equally both The Loved & The Beloved. [i] Boston, Bernie. Flower Power. October 21, 1967. [ii] Ek, Slavoj. Violence: Six Sideways Reflections. New York: Picador, 2008. Print. Previous Post Am I Easy?